It was Saturday around 2:00am, few weeks before JavaOne that I got the mail from Michelle Kovac of Oracle with the fantastic words “you’re in the winners list right now for JFrog”. It took me 3 times to read the mail, and to actually hold the DUKE a few weeks later – to believe it! 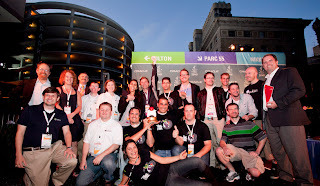 On Sunday evening, Oct. 2nd, at the JavaOne Open House, Oracle welcomed and celebrated the 2011 Duke’s Choice Award winners, JFrog Artifactory was one of them. Together with 9 other innovative Java projects, we “the froggers” stood there and felt like we got kissed and turned into a prince. Imagine that during the last several years, you write open source based plug-ins to integrate with Artifactory’s ecosystem – just to keep Artifactory “open” and to keep the freedom of choice in the developer’s hands, and you know that you are fighting giants with that approach. Imagine that you have been travelling all over the world “preaching” how your Continuous Integration process should look like and how you should build, deploy and distribute your software, and little by little you see followers doing as you advised. …and then, finally you got this huge hug from the community through Oracle. I know its better to play the cool CEO, but JFrog is all about soul and I tell you it was (and still is) awesome!!! Fred Simon our Chief Architect tried toexpresse d that in the live Java Spotlight podcast – in 2 minutes talk, but we know it took much longer to come up to this point of recognition. A week after JavaOne, we are back to ground and working hard to release Artifactory 2.4 with lots of improvements and new cool features like P2 integration to proxy and host all your Eclipse plugins via Artifactory and YUM repository for distributing RPMs directly from your Artifactory server acting as a fully-featured YUM repository.We got the DUKE CHOICE AWARD from Oracle and we are very honored and excited, but I keep remembering the words of one of the JUG’s leaders from the other night at the conference “you’ve got a great tool and a great team – you deserve it” – that’s more than a trophy, this is what we are here for, it’s our reward and we are grateful!We are very pleased to receive this acknowledgement of our technological achievements by Oracle and the community. JFrog strives to provide our users and customers with advanced technology solutions that address their daily CI needs and driven by it. I once wrote “community isn’t a flock” now I know it for sure! Thank you , Enjoy your build, Enjoy Artifactory. See you at JavaOne 2012. JFrog is the home of Artifactory – world’s first Binaries Repository Management Solution. As the first company to provide the software market with a Repository Management Solution, JFrog has established itself as a technology leader in the industry and aspires to continue setting the standard moving forward. Artifactory is also tool that offers an open source, Pro and SaaS (cloud based) versions.